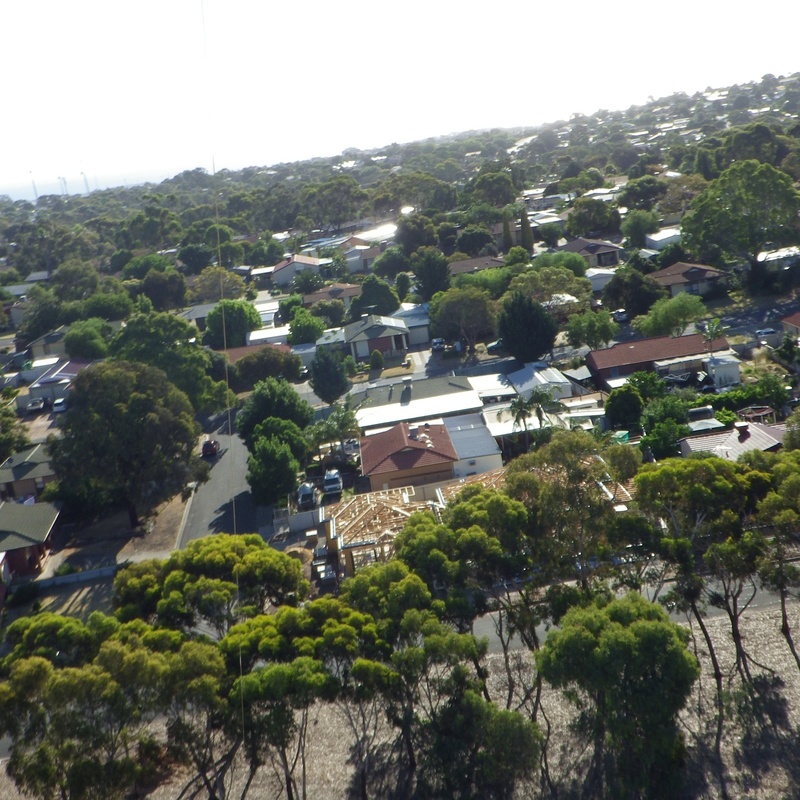 Winds turned out to be almost ideal for doing KAP with the big Multi-Dowel Barn Door kite, which was soon soaring high over South Road in Morphett Vale. Not directly over the roadway of course, but passing motorists would have had a great view of the kite and bamboo cradle in the air. Most would have been somewhat puzzled as they drove on! On arrival the wind was gusting into the 'gentle' range. Flyable but not ideal for light wind kites. However, it was just perfect for the Multi-Dowel Barn Door kite! 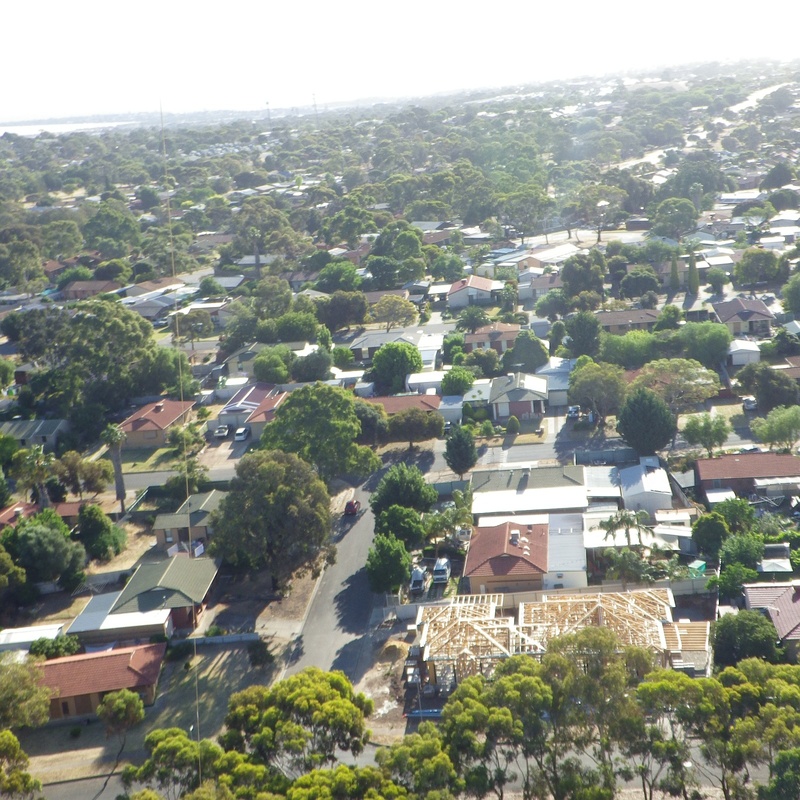 Much like the most recent KAP session, there was not much cloud about and the temperature was pleasantly warm. Also, once again, there was the occasional patch of weak thermal lift. The wind meter recorded an 8kph average with a gust to 19.6kph. Recorded over a minute or so at shoulder height, near the middle of the field while the kite was up. Lifter: The ever-reliable Multi-Dowel Barn Door kite. And this time I remembered to take a few photos, like the one up there. 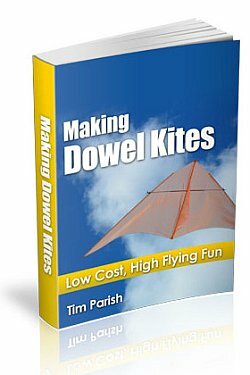 To make your own big barn door kite, have a look at my e-book - at the top of this page. KAP Rig: Bamboo skewer tetrahedron with plastic camera sleeve, suspended from a Half-Picavet line. Camera pointing up-wind. Camera: Pentax Optio WG-2 with built-in intervalometer. 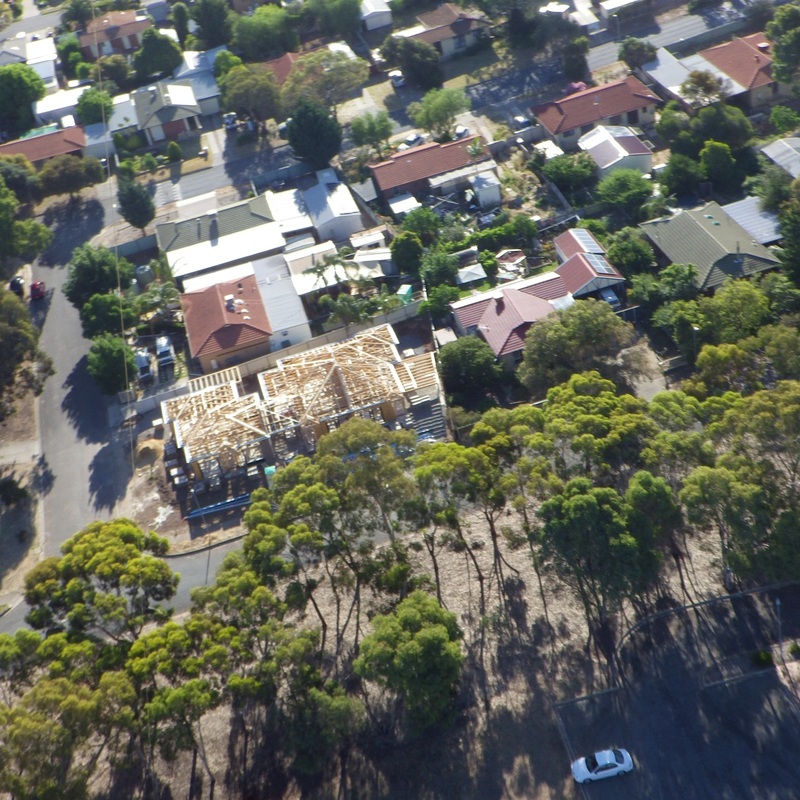 Some settings optimized for aerial photography, others yet to be tweaked. Focus was fixed on infinity. Looking west from Knox Park, from over 200 feet. The sea at the horizon is lost in glare. A slightly under-exposed shot, which makes the ocean clearly visible at top left. The altitude here is probably over 250 feet. Violating a lot of backyard privacy! A bit washed-out, but the sun is getting lower and is not far above the camera's line of sight. 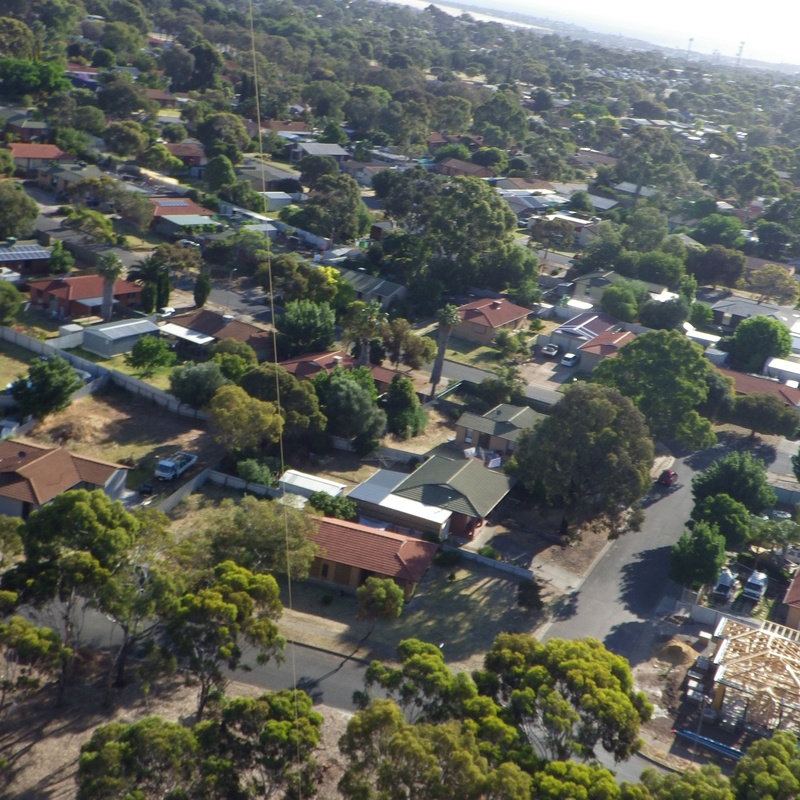 Ever wanted to know what your car looks like from 250 feet? Our Hyundai Lantra is down at the bottom. The long line of trees along the Western side of the field provided some handy potential anchor points for the kite. Not to mention some shade from which to observe the KAP to follow. This time I took the line out quite a way towards the middle of the grassed area, to get away from the wind shadow of the trees and also to keep the KAP rig clear of some play equipment near the anchor tree. Three panoramic photos were taken as I experimented with varying the angle between shots. Only one turned out reasonable, and that's it near the top of this page. Despite some turbulence from the line of trees, the big Barn Door was soon sailing around on 30 meters (100 feet) of line. After taking some photos, it was time to set up the camera for interval shots and insert it into its sleeve. For half a minute or so the rig hovered near the grass as I let out line and the kite struggled a bit in light air. 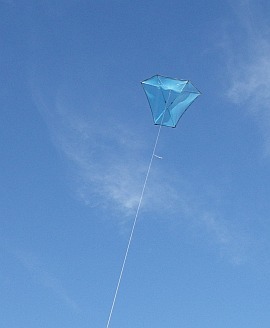 After the 5 minute delay, only 5 minutes were spent taking shots, so it was soon time to bring the kite down. Easily done by slipping the line through a gloved hand while walking slowly out towards the kite. Pausing when extra tension comes on. Also pausing when the kite ended up straight overhead, which can lead to unpredictable antics by the KAP rig! 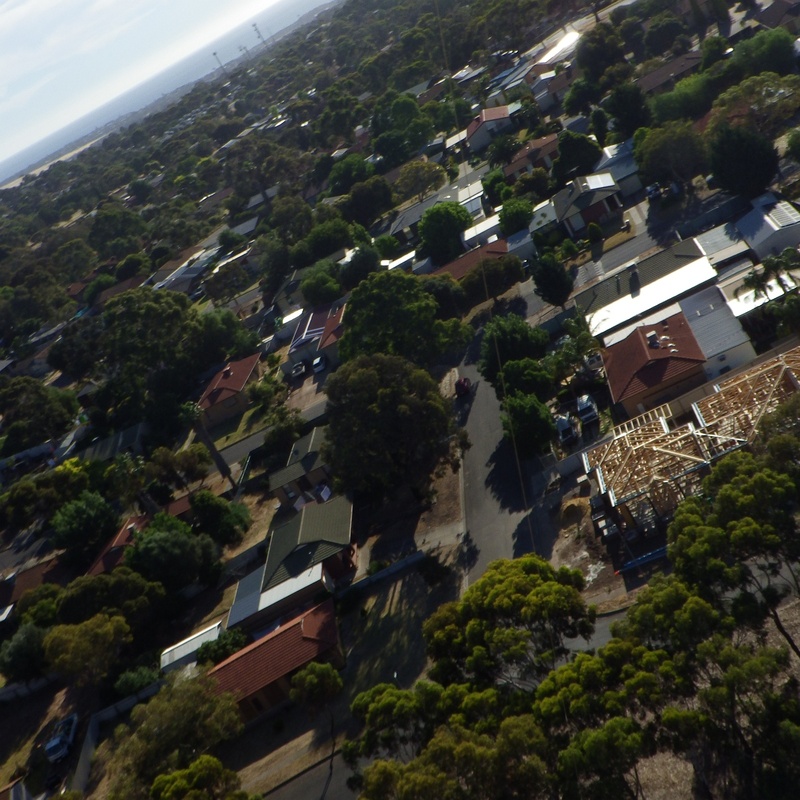 Video was taken this time, during a second great flight by the Multi-Dowel Barn Door kite. However, I'll have to suspend the camera differently in future, to make the horizon horizontal rather than vertical! The current arrangement was OK while plan-view photos were being taken. That is, with the camera pointing straight at the ground. Seeing the horizon makes for much more interesting videos though.